Nowadays the world feels like its full of extraneous signals that tell you exactly what you should and should not be doing, most especially on the roads. Flashing lights and even sound cues at walk signals can lead to an informational overload of mixed signals. When I saw this image of Kino perched on a traffic light, I decided to make a wall in that vein. Traffic lights and signals were traced off of stocks from Stock Exchange; background clouds were also based off of SXC stocks. I like Kuroboshi's flat monochrome works so I kept this wall in that style, with just a little bit of color for the signals. Signal symbols were mostly from Photoshop's default collection of shapes, although I snuck in the Kino logo in one of them, exhorting you to travel more -- because I think that's a good philosophy. I'm not sure whether Kino looks perfectly at home amongst the urban jungle, or if she's trying to shut herself away from it. Either way would be an interesting interpretation. oh thats a truly great wallpaper! I am ever thankful for your dedication to Kino no Tabi. 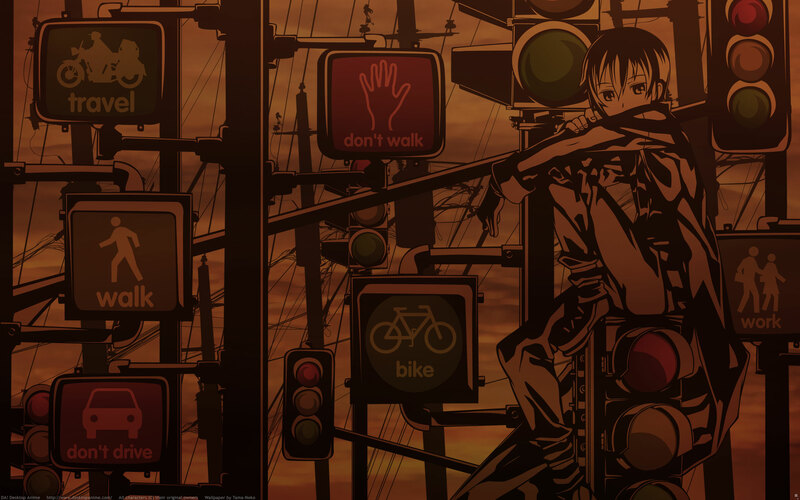 >< You always make the best Kino wallpapers. I especially like this one. The brown and shadowing fits the mood of the wallpaper perfectly, which I interpert that she is perfectly at home admist the traffic lights. Nice interpretation of that scan. I like the fact that there isn't any one focal point that immediately jumps out at you. It makes you stop and look at all of it - there's plenty of detail for your eyes to explore - yet the low contrast holds it all together and prevents it from being overwhelming.